Last night I threw out a teaser titled The Red Door. I hope that the photo in the posting made you want to know more about what was behind that door. Today, I’ll start to fill you in on the details. 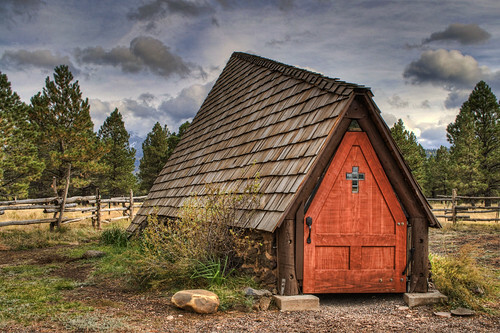 Many years ago, when driving on Highway 180 between Flagstaff and the Grand Canyon, Andy and I came across this quaint little chapel on the side of the highway. It was such an unusual structure that we just had to stop and check it out. We found that it is a small church called “The Chapel of the Holy Dove”, and it’s open to anyone who stops by–the door is never locked. Since we first found the chapel, we’ve always stopped in to visit when we were traveling by, and I always enjoyed taking photos of it. However, once I discovered HDR photography this year, I knew I’d have to go back there and see what it looked like in HDR. We got the chance to do just that when were were in Flagstaff two weeks ago. On March 8, 1999, the Chapel was destroyed by a transient’s campfire but the stone walls remained. Shortly thereafter, 18 year-old NAU student, Christen McCracken obtained permission from Mrs. Lacy to raise funds to rebuild the structure. Since the Chapel had become a popular landmark, the local public supported the project. Many materials were donated by Flagstaff merchants. Volunteers supervised by Flagstaff resident Ricky Roberts, completed the current Chapel, similar to the original, in April 2000. The Chapel is open to All. Four of Dr. Lacy’s six children, the daughter of an Arizona governor and Christen McCracken were married here, besides many others. The chapel of the Holy Dove was named to acknowledge the Third Person of the Holy Trinity, described in Matthew 3:16 as descending “like a dove” above Jesus in commissioning His earthly ministry as God, Incarnate. 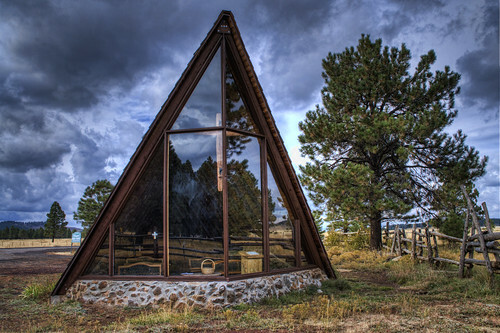 The front of the chapel faces directly toward the San Francisco Peaks, giving parishoners a view that will either inspire them to greater things or totally distract them from the minister’s words. My upcoming posts will give you a view of the interior of this beautiful little gem in the meadows of Northern Arizona. Both of these photos are HDR’s created from a bracketed set (-2.0/0.0/+2.0) in Photomatix V4.0. I used Topaz Adjust and Paintshop Pro X3 to do the post-processing. The photos were shot with my Nikon D5000 and the kit lens (18-55mm, 1:3.5-5.6 zoom), tripod mounted. The entire series is being posted to my Flickr account in the set entitled “Chapel of the Holy Dove“. Please drop by and take a look! This entry was posted in Information, Shooting and tagged architecture, Arizona, AZ, building, camera, chapel, Chapel of the Holy Dove, church, cloud, D5000, Flagstaff, HDR, Nikon, Paint Shop Pro, photography, Photomatix, software, Topaz, tripod. Bookmark the permalink.